Andaz, the lifestyle arm of Hyatt, recently opened (Dec 2016) its luxurious jungle chic resort on the Mayan Riviera, 45 minutes south of Cancun and 10 minutes north of Playa del Carmen. Spanning both beachfront and lagoon-side views, no matter what your room view, you can’t go wrong. Letting the surrounding nature take the spotlight, the decor is minimalist with rich splashes of color owing to the building sized murals created by a local street artist. Far from a mega-resort, Andaz Mayakoba is located in an exclusive gated development called Mayakoba where guests are in good company amongst the neighboring five-star resorts: Rosewood, Fairmont, and Banyan Tree. The room was spacious and set up for us with a crib and a full set of Wee Ollie baby amenities for bath time. We used a space on the bathroom sink for changing our little one and when the attentive cleaning lady saw that we were changing our baby this way, she added extra padding and towels. Bonus points to the great room cleaner – thank you for that. Each room has a balcony overlooking either the lagoon or the beach. The beds and linens were comfortable and the decor of the room included hyperlocal touches as well as beach basics (flip flops and beach bags). Tip: if you have a stroller, make sure to request an accessible room. Some rooms require going up/down steps. The eco boat tour is a must! 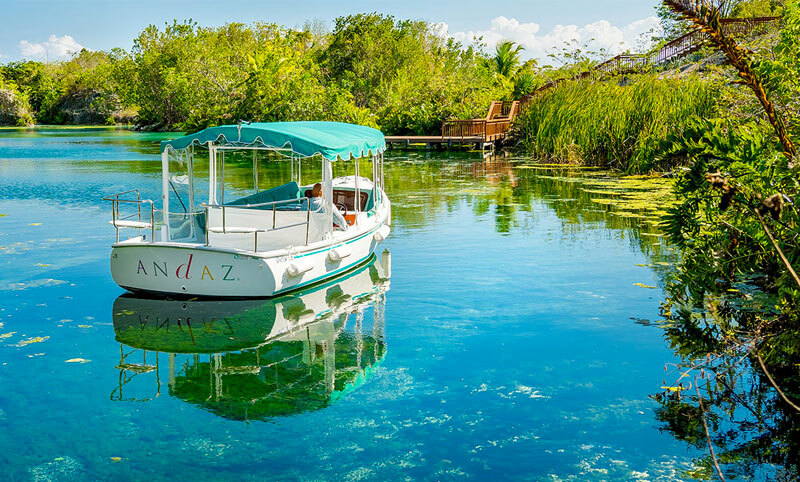 It is a 45 minute spin around the lagoon where your boat captain will point out where the neighborhood crocodiles hang out, explain about the local bird species and where you can peek into the neighboring resorts. Each day the resort offers a full day of activities like flavored ice tasting, and a trip to the El Pueblito and a small cenote. Complimentary bikes are available to ride along the nature trail. This free kids club is chock-full of great activities. Piñata making, basketball games, and drawing contests are just a few of the days’ line up. Kids will love to hang out here all day. And with the pool being in such close proximity, adults can easily come and check in to see how the kids are doing, and vice versa, the kids can come for a splash in the pool. The resort offers four fresh and delicious restaurants to choose from – Cocina Milagro for the excellent breakfast buffet, OllaTaco and OllaCeviche for casual bites that go perfectly alongside the pool days, and Casa Amate for sophisticated Latin fusion cuisine.